Carlisle Adjustable Flame Length Burners are used in both the glass and plastic industries. In the glass industry, the warm gas air flame is often used in the neon industry for tube bending operations. 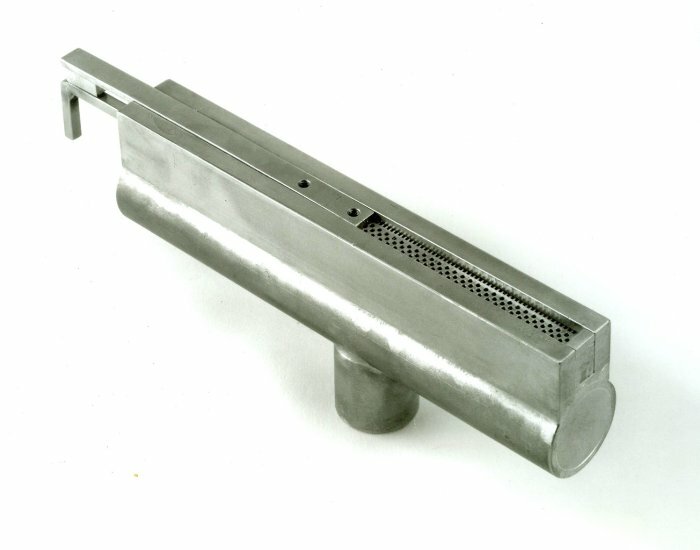 This burner has also been used in warming-in or warming -out applications where higher heat gas oxygen burners are used to work the glass. While in the plastics industry, the Adjustable Burner delivers a high level of surface treatment to plastic bottles and containers. This burner series is especially advantageous for setup where variable lengths of product are treated, since the adjustable flame length allows for great flexibility. The Adjustable Flame Length Burners are suitable for use with a mixture of natural gas, propane, or mixed gases and air. The Adjustable Flame Length Burners feature a brass construction. The body and the slide are brass, the slide is the only exception with a slot of stainless steel being used for the bottom of the slide that allows for the flame lengths adjustability. The brass insert features three rows of drilled porting that provide for a precision flame for gas air applications. The drilled porting is supported by milled slots that run down the length of both sides. The milled slots constitute the piloting that supports the main drilled port flame. The slide is used to adjust the flame length of the burner. By moving the slide inward or outward, the operator seals off or opens up the flame length until the desired flame length is reached. It is important to note that it is not recommended that any Adjustable Flame Length Burner be sealed off to any more than half of its maximum flame length. Adjustable Flame Length Burners are available in several configurations. If you have a special application that requires a custom flame length or setup, please feel free to contact your sales representative.